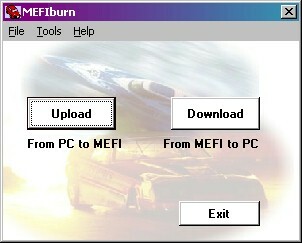 MEFIburnTM allows you to move your tuning definitions between the MEFI controller and your PC or Laptop computer. There are 2 main functions in the program, Uploading (sending a tune from the PC to the MEFI controller) and Downloading (retrieving a tune from your MEFI controller to your PC). Before doing either of these functions, you need to tell the system what type of controller you are using and what COM port on the PC to use. The Preferences selection allows you to do that (on the menu under File->Preferences, or by clicking on one of the MEFI or COM buttons on the Upload or Download Pages). The preferences allow you to select COM1 through COM8 for communications. The MEFI Scan & TuneTM cable is a USB cable, but it installs as a virtual COM port on your PC. You can also select your controller type. 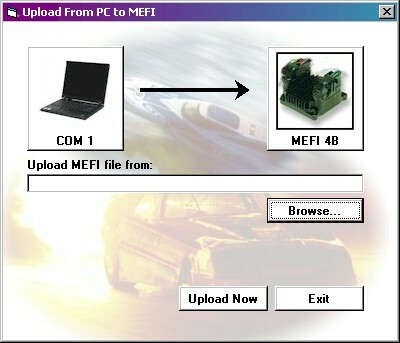 The MEFIburnTM program can work with MEFI1, MEFI2, MEFI3, and MEFI4 controllers, as well as several variations of each. 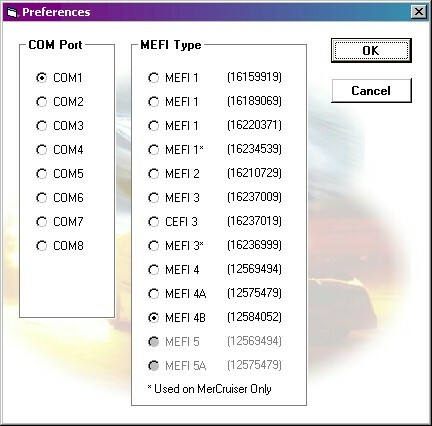 The Preferences box specifies the part numbers of each controller type to aid in the MEFI type selection. Once the preferences have been set, Downloading can begin. Once the file name has been specified, click "Download Now" to save the file to your PC. Once the controller has been unlocked, it will allow free communications until the ignition has been turned off. After that, the controller must be unlocked again. If the password is not available or has been forgotten, there is another more drastic option - you can clear out the controller memory. This will completely erase any tune in the controller along with any password lock. You can then start with a stock tune and modify it to suit your needs. 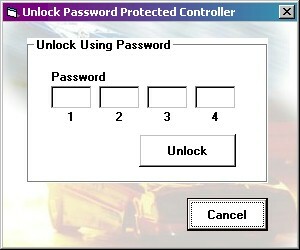 Of course any password locked custom tune already in the controller will be lost. After editing the tune, the next step is uploading the tune back into the controller. Just as with the download function, browse to select the tune on your PC (BIN, PTP, ASM, UMI, or CAL types) and click "Upload Now". Sometimes you may need to convert a file from one type to another, so we have provided a handy file conversion tool to allow you to move files between BIN, PTP, ASM, UMI, and CAL formats. We also have a menu item in MEFIburnTM to clear all Malfunction Diagnostic Trouble Codes (MALF's or DTC's) that have been set or are pending in the controller. The trouble codes and warnings are viewed from a list within ScannerPro, along with all monitored engine parameters.